On several occasions I have addressed youth groups such as Cub Scouts and Four-H Clubs and have discussed the “Hug-A-Tree” programs that teach kids how to survive when separated or lost from a group. 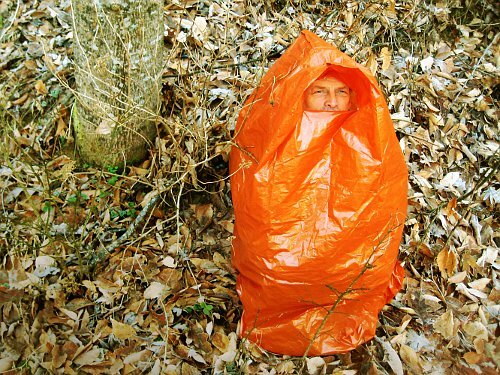 A list of supplies that are suggested by the program included an orange trash bag with which to stay warm, keep dry, and be more easily spotted by rescuers. I was able to acquire an orange trash bag and decided to try it on for size and crouch down for a bit to experience it’s use as a shelter. Generally speaking there are a variety of plastic bags that can be used for this purpose and are available in different thicknesses and for different purposes. Contractors trash bags are generally black and heavy duty with a thicker mil number and can be found at a hardware store. Home garbage-can/leaf bags are produced in various dark colors and can be found at a grocery store. 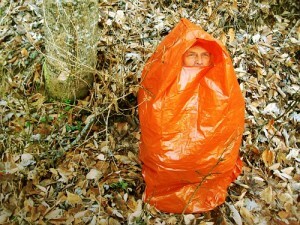 The orange trash/leaf bags are often used for highway roadside cleanup and can be found at a janitor supply store. When choosing a bag for your hiking/survival kit it is important to select a bag that is big enough to completely cover your body in a crouched position. The orange bag shown in the photo had pleats at the bottom that formed a gable when a hole was cut inside it. When I use other bags as a shelter I place a corner above my head like the peak of a roof then cut a horizontal slot at eye level then flip the upper edge up and outward to make a small rain gutter over the opening. If you are caught in the rain be aware of water shedding paths and position your covering to drip on the outside. A plastic bag does a good job of containing your body heat but is also susceptible to condensation and can conduct cool temps when your skin touches it from inside. It’s best to wear clothes that give you insulation from the plastic thus keeping you warmer and dryer. The small window at the top prevents asphyxiation and gives you a view to watch for your rescuers. I recommend carrying plastic bags in your emergency kits whether in your vehicle, in the office, or hiking bag. They don’t take much space, are inexpensive, and can be used in a variety of ways. 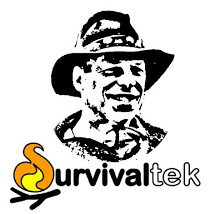 It’s a great resource for preparedness. This entry was tagged Emergency, Hug-A-Tree, Shelter, Survival, Trash. Bookmark the permalink.